Located on the second floor of the distillery, Warren Hall blends a traditional rustic feel with modern amenities. The unique, 8,000-square-foot space features a seating capacity of 350 and a cocktail-style capacity of 500, allowing it to accommodate events big and small. The wood floor was custom milled from reclaimed wood to evoke the look and feel of the original Featherbone Factory floors. Forty 93” tall windows line the walls, showering the room with incredible natural light, which offers spectacular sunset views. A bar encased in wood salvaged from the factory floor supports an 18-foot custom-made zinc top, and the light cluster above the bar is constructed from the original factory lights and serves as a focal point for the room. Other features on the second floor include a phenomenal bridal suite, restrooms, our catering kitchen and a convenient elevator. Our newest event space, The Grainery, sits atop the Staymaker Restaurant and shares the same downward view of our beautiful Kothe distilling equipment and production facility two stories down. This space offers an incredible, unparalleled view, along with a gorgeous copper bar top, 93" tall windows, and the building's original freight elevator shaft. 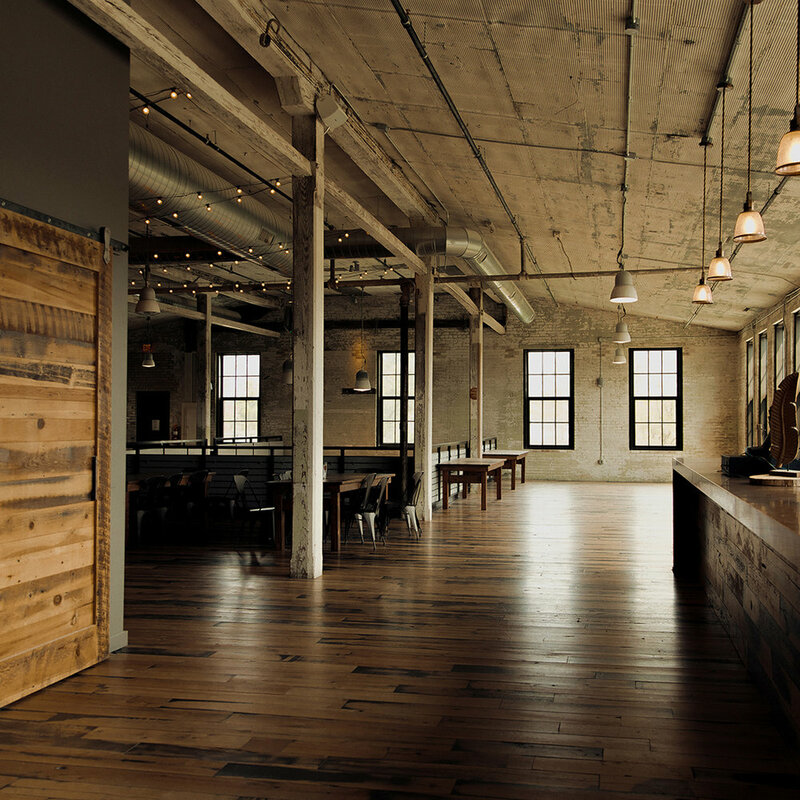 The Grainery is a unique space that is perfect for parties, weddings, corporate events, holiday gatherings, and more. The Still Room takes its name from the large gallery glass wall that gives a full view of Tassy, our first Still, that has been used to craft our organic spirits since 2010. The ceiling and support beams are exposed, enhancing the rustic warehouse feel of the space. Barn wood salvaged from the family farm in central Indiana shape the sliding pocket doors. Salvaged wood joists from the Featherbone Factory were used to craft our Viking table, a large 20-person banquet dining table, and is included with the rental of the space, as well as additional seating for up to 100 guests as needed. This charming, intimate space has a dining capacity of 100 and cocktail-style capacity of 150 and includes private access to our outdoor patio. Looking for that awesome experience for your friends or family? Still Side is the ticket! An experience like no other - get up close & personal with our production facility, while enjoying amazing food & drink! Dine next to our batch tank, mash tank, fermenters and our 5000 Liter Kothe Still, affectionately named Ethyl. The Still Side Experience can be customized for your party to include food & beverage and a private tour & tasting! Seating capacity in this space is 30 guests. There is a required minimum food and beverage spend. Contact us for information & pricing.